This program provides you with the training and knowledge requir ed to safely freedive with a buddy in open water environments to depths of 20 metres. You will earn the SSI Level 1 Freediving certification after completing this program. To enrol in an SSI Freediving Level 1 course you must be at least 12 years old. You need adequate swimming skills and need to be in good physical health. 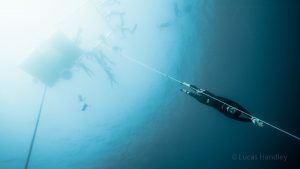 No prior experience with freediving is required. Open water sessions to practice constant weight freedives, plus proper buddy procedures. Goal – constant weight freedive between 10 and 20 metres. All but the open water sessions can be completed as part of an SSI Freediving Pool program. An SSI Freediving Level 1 course costs $590 (for Brisbane-based courses). If you already hold a SSI Freediving Pool certification, the cost is $420 (for Brisbane-based courses). One day of open water sessions (light snacks will be provided). A fun dive with wildlife, after all open water skills are completed (time and conditions permitting). If you have completed an SSI Freediving Pool certification, your course fees include certification costs (upon successful completion), a knowledge and practical skill review, and one day of open water sessions (including fun dive if time permits).